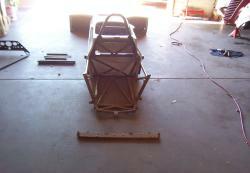 This car is chassis no B20-9 similar to one run by Steve Millen it has a Ford Cosworth engine. 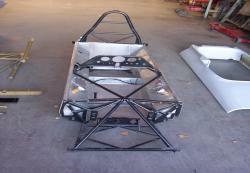 The chassis is original but the alloy "tub" around the tubes is new as is the fiberglass bodywork. 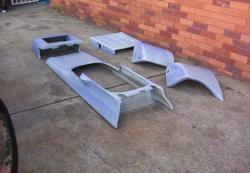 The rear of the chassis is detachable and was sand blasted clean with some other small parts. All of the chassis paneling was pretty much new it was decided to clean the exposed tubes by hand. The original paint came off easily with scotchbrite and thinners it was a bit of a fiddley task but. 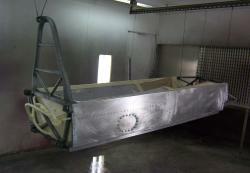 The tub was then masked up and hung ready for priming and painting. 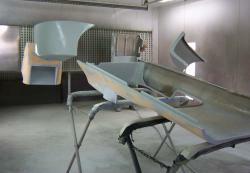 The body work was primed in 2 pack primer and blocked using a little filler to make it smooth ready for painting. 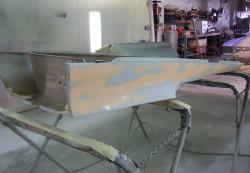 Priming the parts in hi-fill primer. 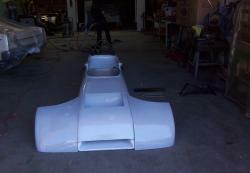 A guide coat was then appiled and the body work put out to dry.